I had occasion to try my hand at melting wax and straining honey this past week. It was good to try it on a small scale, given I have never done either before. This post has the story and pictures. I have been collecting various wax pieces over the past year. Some comb scrapped from the hives, top bar comb that fell or didn’t quite work out, and some plastic frames that I removed from the hive in favor of wax frames. I recently bought a pot and bowl as a double boiler, and found some time to melt the wax. I did this last weekend, although I didn’t have any cheese cloth or other straining material. So I just melted the comb to see what would happen. The following picture shows one of the two plastic frames I had pulled from the hives. As you can see, the bees built it out kind of weird. I have seen this on plastic frames in my hives and in others. Perhaps the bees remove the wax and then don’t want to build on the plastic. These frames came in my original nuc, so I replaced them this spring with non-plastic frames. In any case, the wax in the bowl melted in about 90 minutes, longer than I’d hoped, and the end result was not very usable. Too much dead brood in the comb and other non-waxy stuff that I hadn’t filtered out. 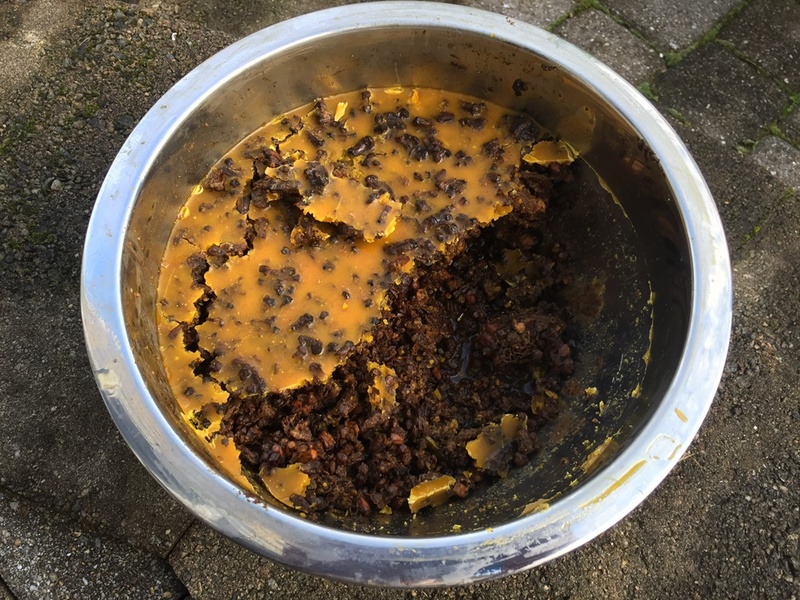 So I had a bowl of crud with some melted wax at the top, as shown in the picture. Not really what I had in mind, and I was surprised how little wax was actually present. I stored the wax pieces in a ziploc bag, and ordered some cheese cloth for my next attempt. Stay tuned. 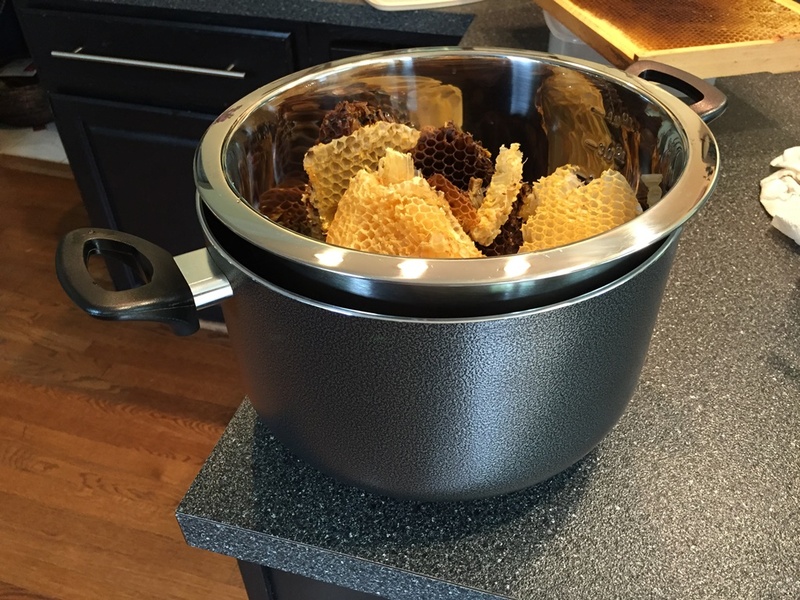 I had a bit more success making some honey. One of my top bars broke. The kerf (a wooden strip) just fell out of the slit in the top bar and the comb dropped to the floor of the hive. A good argument for top bars from a single piece of wood. Th failed kerf was in the hive I purchased, so no idea what glue was used. For the hive my father and I made, we used Titebond III glue which should hold up pretty well. 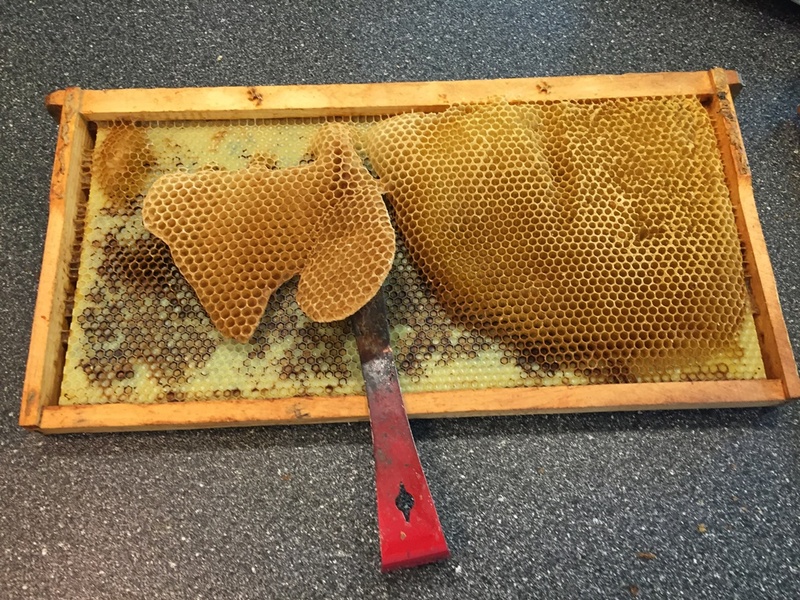 In any case, one-third of the comb was capped honey. I cut this away and strained the comb in a small strainer, adding the uncapped comb to my bowl of melting wax. Over the course of a couple hours I ended up with a small bowl of honey. 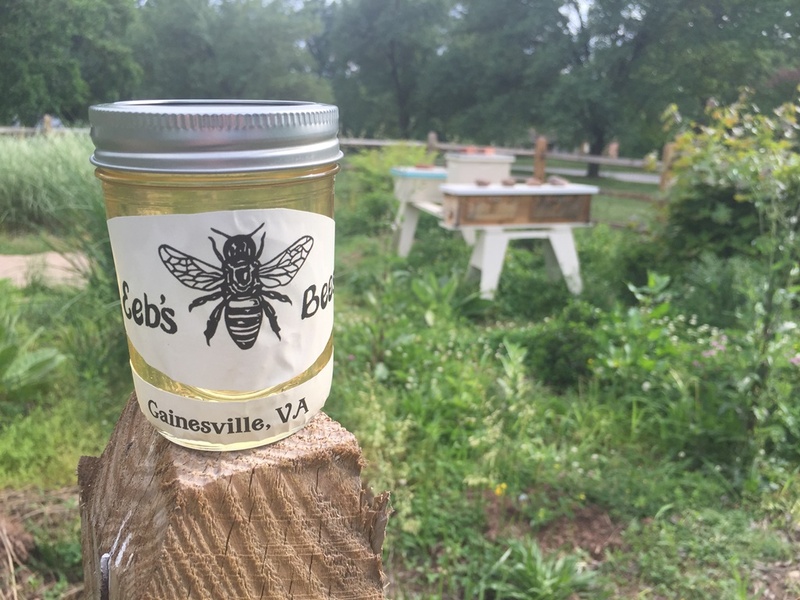 For my birthday in 2015, one friend gave me a case of 8 oz mason jars, and another some honey labels (which I cut down to fit the jar). My first opportunity to put them to use. I filled one jar and part of a second. A very light honey, probably spring trees and clover if I had to guess. Of course, while the honey and wax are free for the taking, the hives and bees cost me both time and money to establish. So perhaps not really free. Makes for a nice title, though. 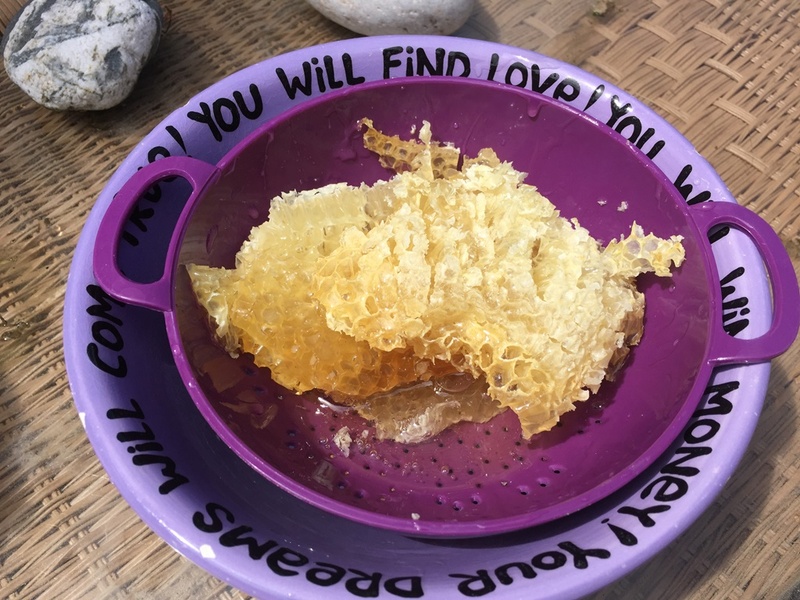 It’s always so exciting to get your first bit of honey and wax! I’m always amazed, too, at how little wax is in comb. It really is an engineering marvel when you see an ounce or so of wax (or cocoons) holding 4.5 lbs of honey. How do they do that? They’re incredible! Congrats on your honey harvest! It looks delicious! hi. if you have an old saucepan I recommend just chucking all the wax bits in with some boiling water from your kettle. melts much quicker and a lot of the crud ends up in the water. the wax floats to the top and brood cases underneath. you can then use the double boiler and cheesecloth for second stage. I’ll have to try that, thanks Dewey. I’ve seen a number of folks who simply do a single stage with cheesecloth and strain it all in one go. I was worried about heating the wax directly over the heat so I double-boiled it. Clearly my way did not work so well, looking forward to using the cheesecloth when I have a bit more wax in the future.